A ray of light for MetroPCS? Samsung has added another device to the Galaxy line of Android smartphones, and it's a MetroPCS exclusive for now. The Samsung Galaxy S Lightray 4G is being described as a mid-range smartphone with a unique combination of capabilities that could make it an attractive contender for techies and civilians alike. For one thing, the phone's 4G LTE connectivity coupled with its Mobile Hotspot technology will make for easy tethering right out of the box. 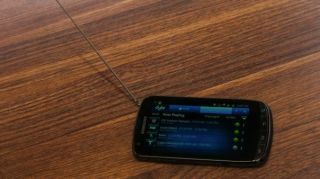 And its much-touted Dyle mobile TV service makes it the first US smartphone with live, local television. Where available, Dyle TV service will be free to Galaxy S Lightray users with a MetroPCS 4G LTE plan. The service allows Samsung Galaxy S Lightray users to watch local and national programming, including sports, entertainment and news, live on their phones. Dyle TV service is available in select cities across the US, including major tech hubs like New York, Kansas City and San Francisco. The Samsung Galaxy S Lightray runs Android 2.3: Gingerbread and sports a 4.3-inch Super AMOLED touchscreen, an 8-megapixel rear camera with LED flash, and a 1.3-megapixel front camera. The Galaxy S Lightray's specs sheet also notes its 1GHz processor, though it fails to mention make, model or number of cores. Similarly absent are details about the Lightray's battery, RAM and display resolution. TechRadar has reached out to Samsung to confirm these details and will update when they're available. In the meantime, it might be wise to hold off on rushing out to purchase the Galaxy S Lightray until its full specs are released. For those who can't wait, it's available now from MetroPCS for $459 with no contract. Plans start at $40 a month with unlimited text, talk and data, although only the first 250MB will arive at 4G LTE speeds.